Week one of the 2018 AFL Finals series kicks off Thursday night Melbourne time with ladder leader Richmond hosting Hawthorn at the MCG. 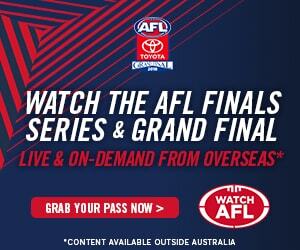 Right now Watch AFL is offering The Finals Series Pass providing instant access and goes through to the 30th November 2018. This includes the Grand Final.. This pass includes all AFL Premiership season matches live and on replay, the Finals Series plus access to FOX FOOTY content.